Of all the places that I have been to in the world, I would have to vote Nusa Penida Bali in the top 3 most awesome destinations to visit! This magical island offers a mecca of adventures and locations that will leave your jaw dropped and gasping with excitement around every corner! Wondering what Camera & Photography Gear I use while backpacking around the world? Click here to view my gear list and essential travel items that I recommend for your next adventure! Ferries operate daily to Nusa Penida from Sanur Port in East Bali. You can book the ferry online in advance to guarantee the lowest price. The ferry ticket to Nusa Penida also includes transfers from your accommodation in Bali to Sanur Port. The boat trip takes approximately 30-minutes to Toya Pakeh Harbour in Nusa Penida. You can also take a boat to Nusa Penida from Nusa Lembongan if you happen to be exploring this island first. 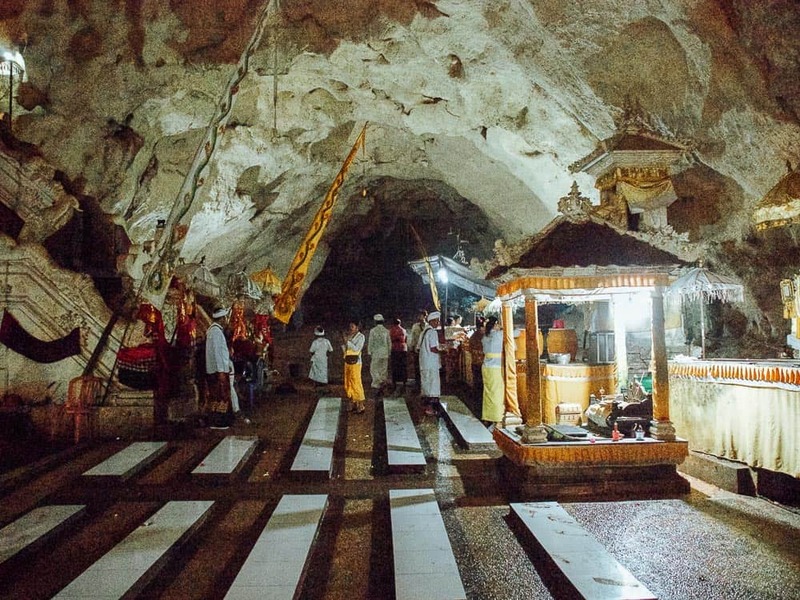 A return Nusa Penida trip will cost you 100,000 Rupiah. You can organise the boat via your accommodation on Nusa Lembongan or simply head to the main harbour on Lembongan and ask one of the boat companies down there. To help you plan your trip to the Nusa Islands, you may want to check out my other articles of the Top 5 Things To Do In Nusa Lembongan and Top 3 Things To Do In Nusa Ceningan. When you arrive at Toya Pakeh harbour there are a number of scooter rental shops on the beachfront that will be able to sort you out with some wheels. My friends and I paid 70,000 Rupiah per day with a full tank of gas. This was the lowest price we could haggle for, the locals wouldn’t drop their price any lower. Be sure to get a helmet as an extra precaution for riding on the roads in Nusa Penida as they are not very well maintained with potholes and loose gravel everywhere. Kelingking Secret Point Beach is up there with one of the most amazing places I have ever been and one of the best things to do in Nusa Penida. 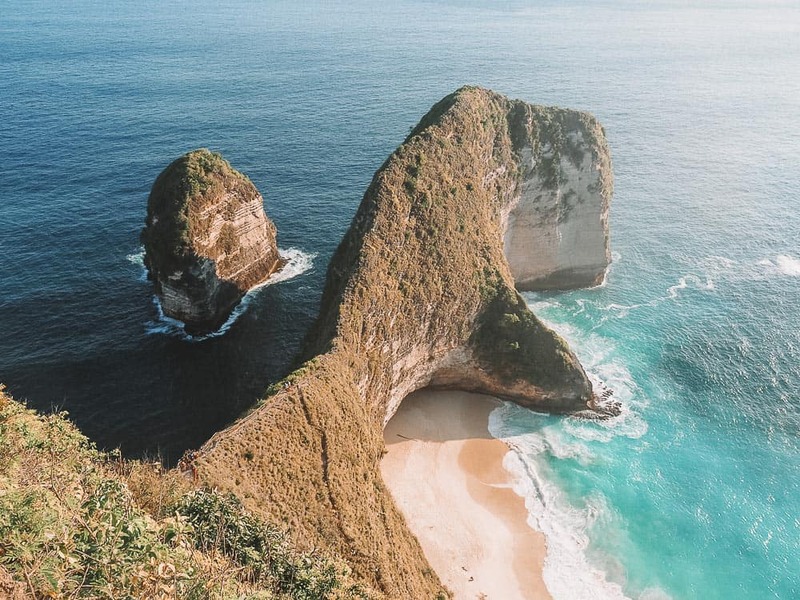 Kelingking Beach on Nusa Penida island has become the biggest tourist attraction on the island thanks to Instagram and for a good reason, I mean just look at this view! Kelingking Beach is located on the west coast of Nusa Penida Island, approximately 45-minutes drive from Toya Pakeh harbour. 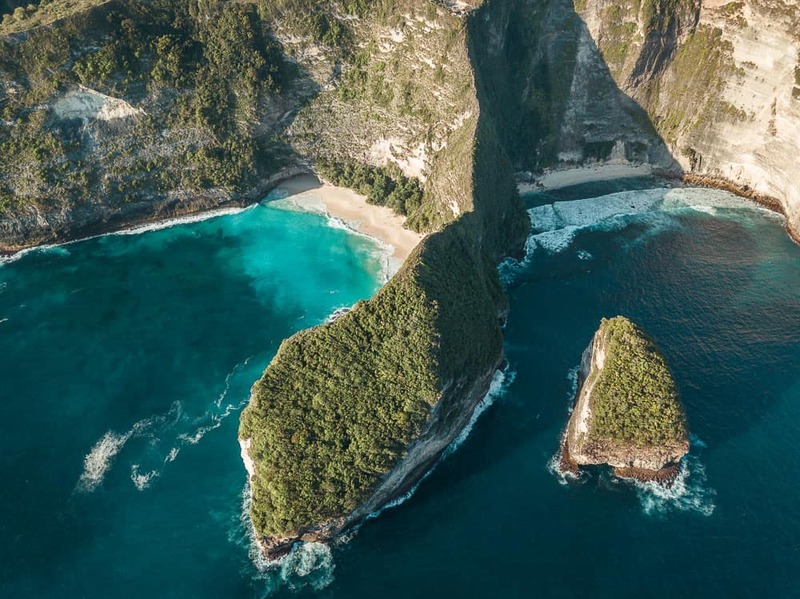 The reason why Kelingking Beach is such a popular location and rated one of the best things to do in Nusa Penida is that the cliffs form the shape of a T-Rex dinosaur. The head of the T-Rex can be seen on the left of the bay and the body and tail wrap around to the right. Access to the Kelingking Beach is possible but explore at your own risk. There are stairs and railings made from sticks and bamboo that lead down the spine of Kelingking to the beach though don’t rely completely on this and take your time when descending to the beach. 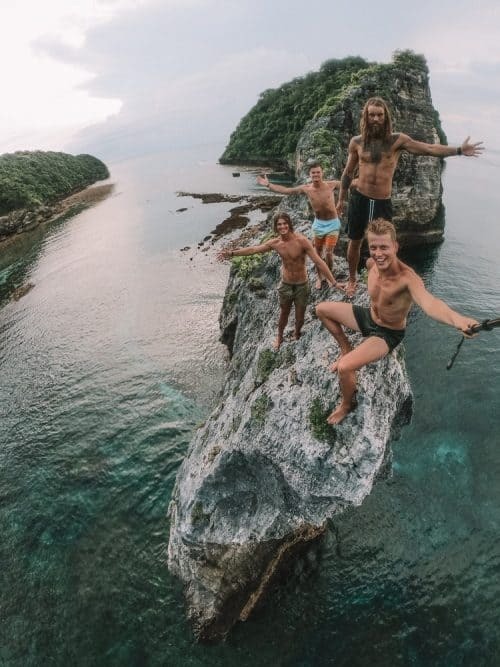 My friends and I made it down to the bottom of the cliffs safely and we went swimming in the powerful waves on Kelingking Beach. The ambience of being surrounded in a bowl of enormous cliffs was next level. 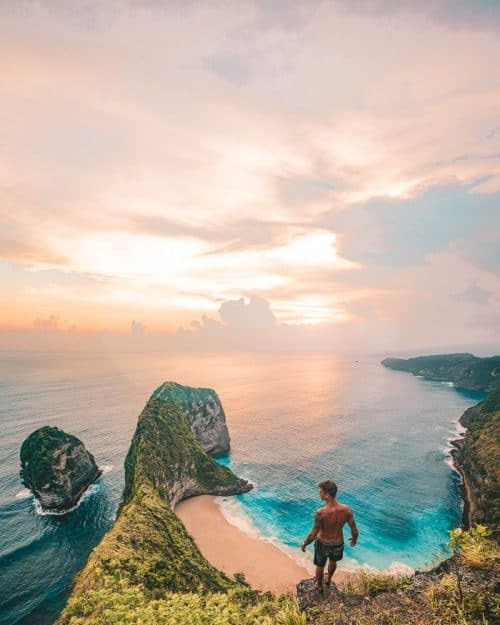 Kelingking Beach has multiple viewpoints around the edge of the cliffs offering spectacular views up and down the coastline of Nusa Penida. CLICK HERE to see the full blog post of Kelingking Beach. 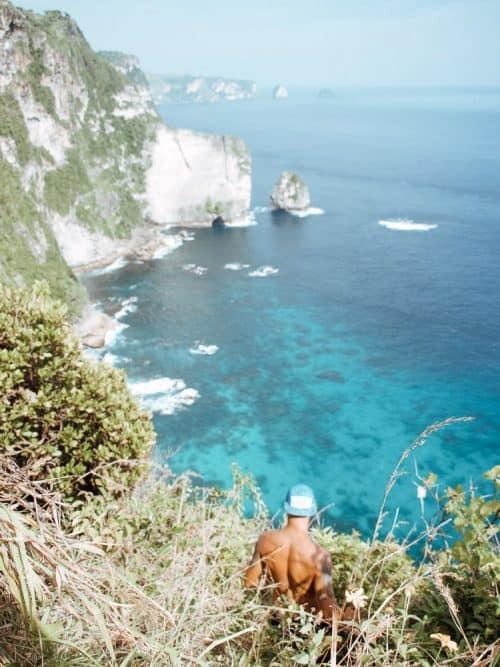 Banah Cliff Nusa Penida is yet another epic viewpoint along the cliffs of this incredible island! 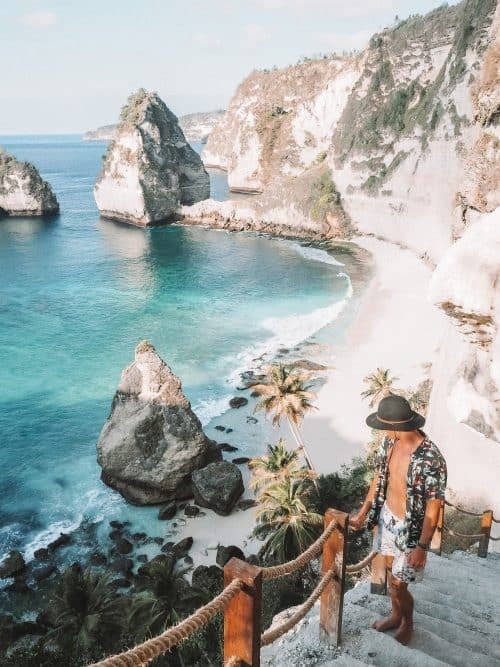 This particular location is not as popular as Kelingking Beach though it is equally impressive and makes it one of the best things to do in Nusa Penida. The Banah Cliff is located on the west coast of Nusa Penida. From the main harbour of Toya Pakeh, it is approximately a 45-minute drive to Banah Cliff Nusa Penida. You can rent a scooter at the harbour here for 70,000 Rupiah per day. 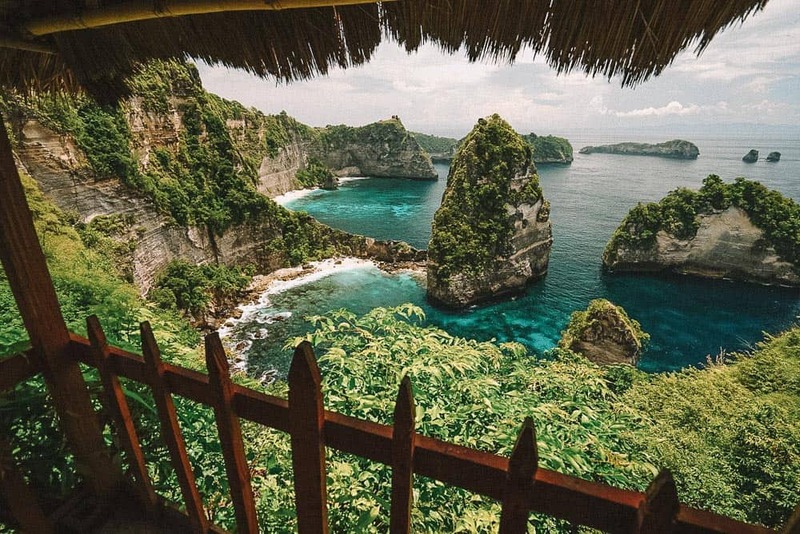 There is not just not one but two incredible viewpoints at Banah Cliff Nusa Penida. Surprisingly, we did not have to pay for parking or any entrance fees for this location which was great. It is spots like these that I love to discover before they get too popular. The first is the panoramic viewpoint that faces west and offers extreme views of surrounding cliffs, perched high above the ocean. On a clear day, you can actually see the tail of the T-Rex at Kelingking Beach. Be very careful when taking photos here as there is no safety barrier to protect you from falling hundreds of feet to the ground. Know your limits. The second is the Banah Cliff which faces east and offers an awesome viewpoint of the arched rock island out to sea. Again, watch your step along these rocky cliffs. CLICK HERE to see the full blog post of Banah Cliff. Snorkelling at Manta Point Nusa Penida is up there with one of the most epic experiences I have ever had and one of the best things to do in Nusa Penida. These humble underwater giants fly through the ocean like eagles in the sky. From Nusa Penida island, snorkelling boat tours operate out of Crystal Bay and Toya Pakeh to Manta Point Nusa Penida. 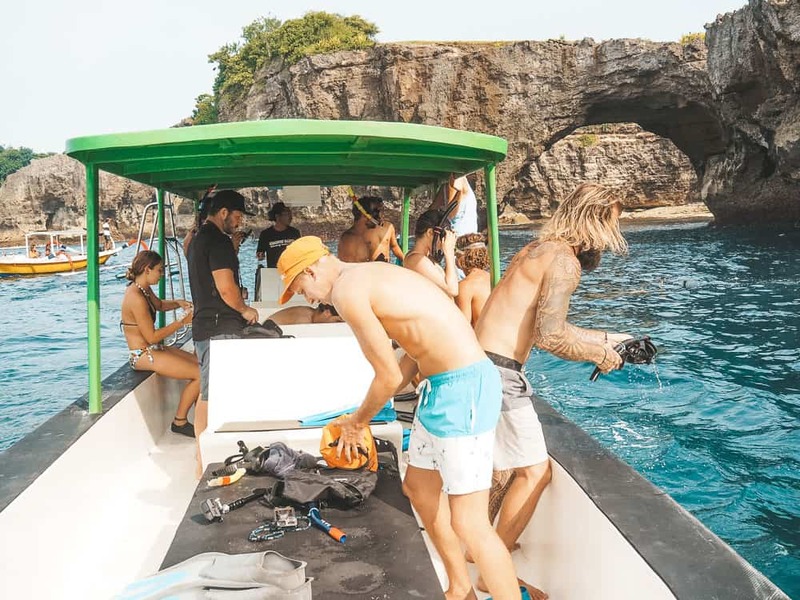 You can book a snorkelling via a number of tourists offices or your accommodation on Nusa Penida island or alternatively, get chatting to some of the locals at Toya Pakeh harbour and they will be able to help organise your snorkelling trip. 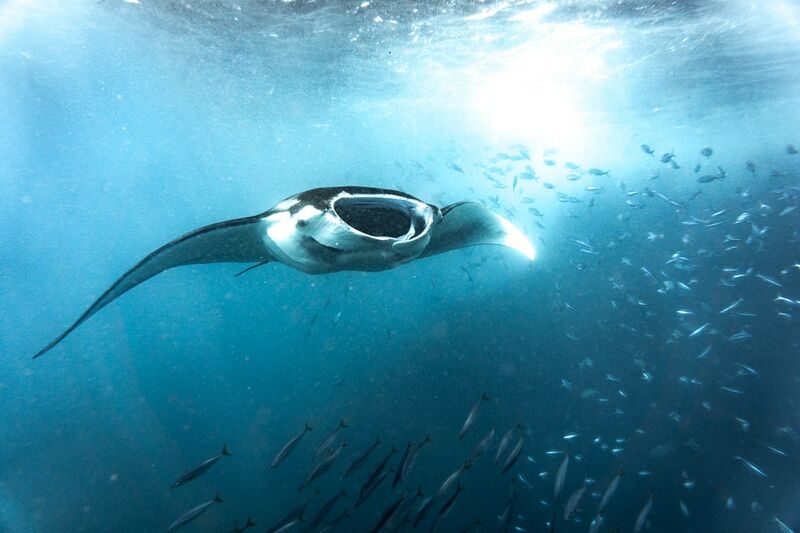 The cost of a Manta Point tour is 200,000 rupiah. These majestic creatures are absolutely incredible! They glide effortlessly through the ocean and are really friendly to swim with. 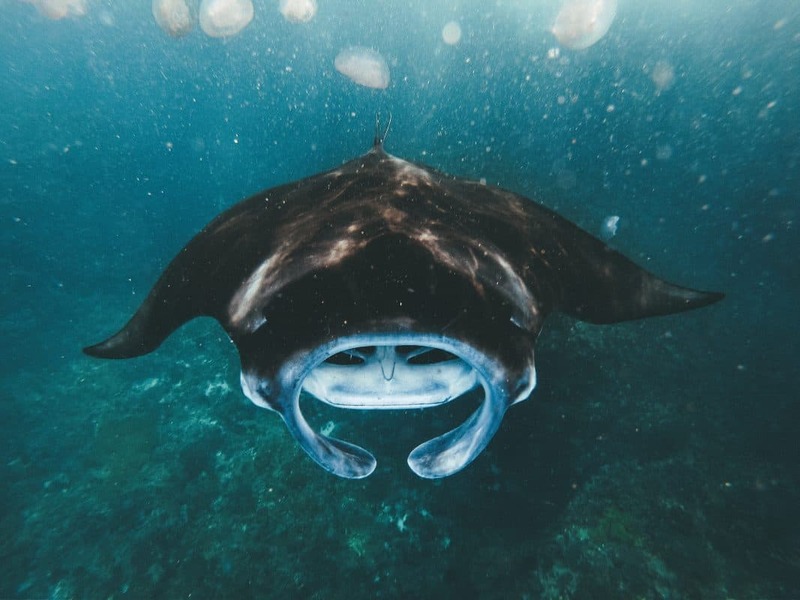 The manta rays can be quite intimidating to begin with due to their body size of up to 5 meters, though you will soon realise they are harmless, humble giants. I counted roughly 8-10 different mantas at Manta Point Nusa Penida on this mornings snorkelling adventure, which is more than usual. I think it is safe to say we got very lucky! CLICK HERE to see the full blog post of Manta Point! 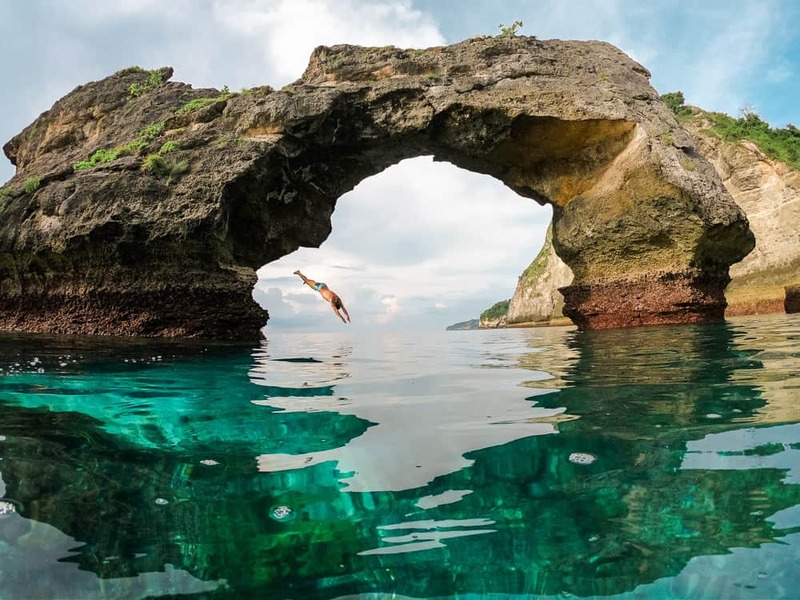 Angel’s Billabong is one of Nusa Penida’s most popular attractions and one of the top things to do in Nusa Penida. This natural infinity pool is framed by rock cliffs and hangs out over the ocean overlooking Manta Point Beach. 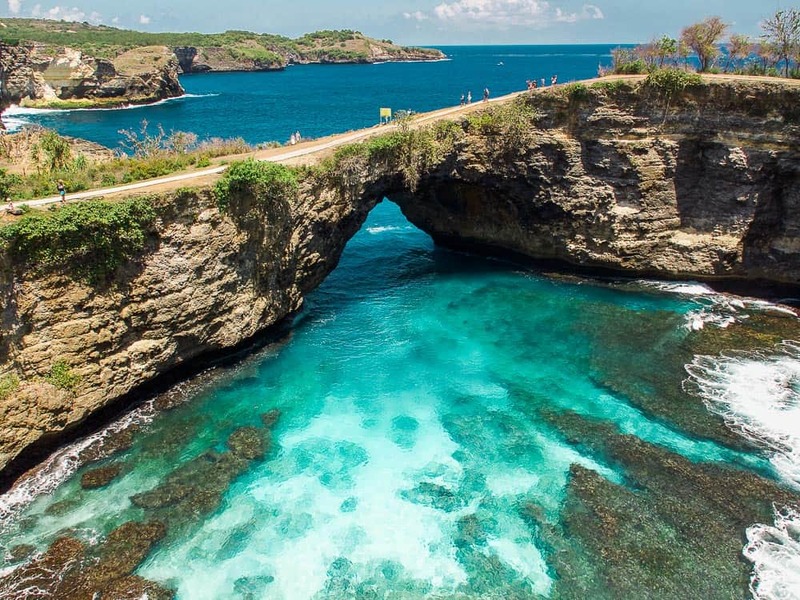 The Angel’s Billabong Beach can be found on the far most western tip of Nusa Penida’s coastline. When you arrive at the carpark on the cliffs you will be asked to pay a parking fee of 5,000 Rupiah. There are signposts leading the way down the steps to Angel’s Billabong, so you won’t get lost. There are a number of viewpoints of Angel’s Billabong, my personal favourite was down in the infinity pool itself. The water is clear as crystal and the temperature was nice and warm on a crisp early morning. 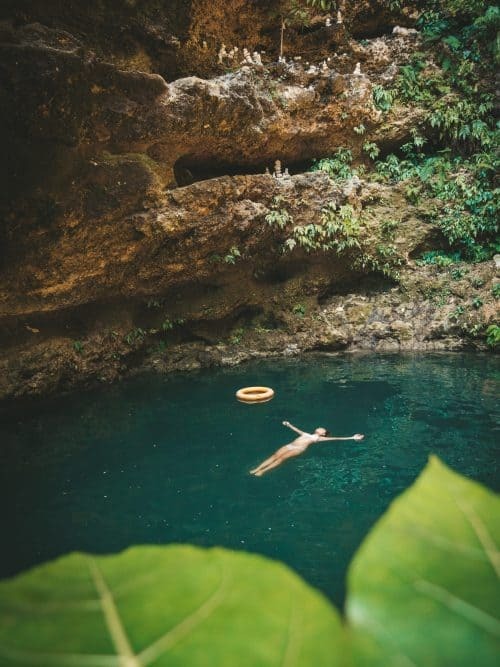 CLICK HERE to see the full blog post of Angel’s Billabong. 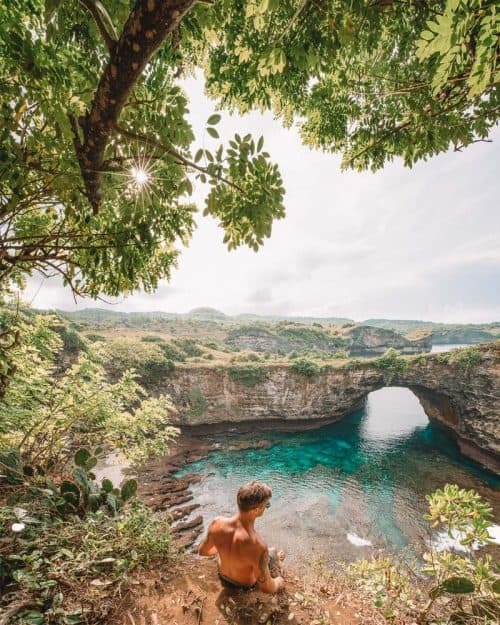 Broken Beach Nusa Penida is one of many awesome locations on the island and it is not to be missed! The natural bridge stretches over turquoise waters that flow in and out of the archway, hence the name Broken Beach. Broken Beach is located on the far most western tip of Nusa Penida’s rocky coastline. From the main harbour of Toya Pakeh, it is a 1-hour drive. Also at this location, you can find Angel’s Billabong, a natural infinity pool on the edge of the cliffs. Although you can’t go swimming at Broken beach Nusa Penida it is such an unreal setting in itself. The ocean water flows into a bowl that is surrounded by towering cliffs. You can take a panoramic walk all the way around Broken Beach to several different viewpoints offering incredible views of this hole in the cliff. CLICK HERE to see the full blog post of Broken Beach. 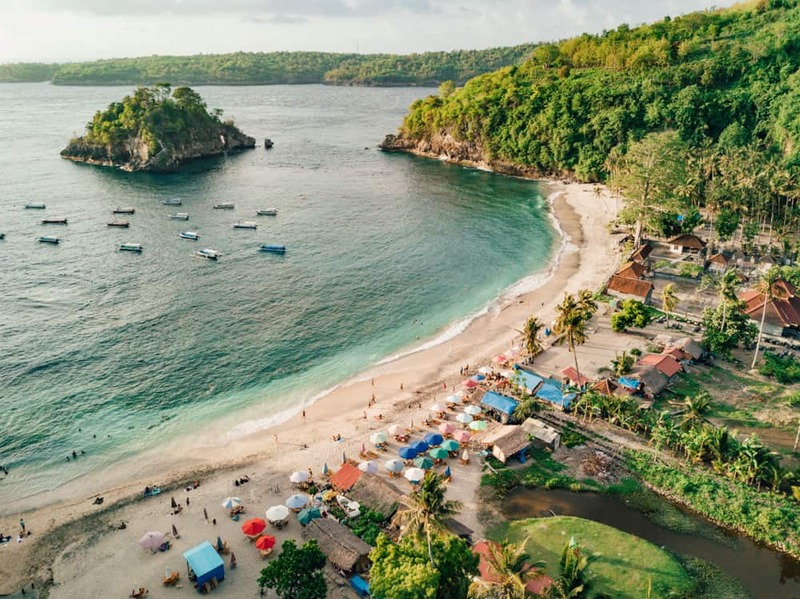 Atuh Beach is one of Nusa Penida’s most iconic locations and makes it to the list of best things to do in Nusa Penida. The natural rock arch that stretches over crystal clear turquoise waters will have you in awe as soon as you lay eyes on it. Pantai Atuh Nusa Penida can be accessed from either the left or the right-hand side of the cliffs via the concrete steps that are cut into the side of the mountain. It takes approximately 5-10 minutes to hike down to the beach. Atuh Beach is located on the far most eastern point of Nusa Penida island. It is approximately a one hour drive from Toya Pakeh. The best time to visit is for sunrise and you will most likely have the beach all to yourself! The natural arch rock, in my eyes, forms the shape of a prehistoric dinosaur of some sort that looks like it is ready for battle haha. Would you agree?! We were so curious about the formation of this natural arch, so we decided to swim out to it on low tide. It was much more impressive once we were swimming through the arch. We checked the depth of the water to see if it was possible to cliff jump. Our guess was that it was between 3-4 meters deep which was plenty enough for us, so we scaled the rock arch and jumped off one by one! 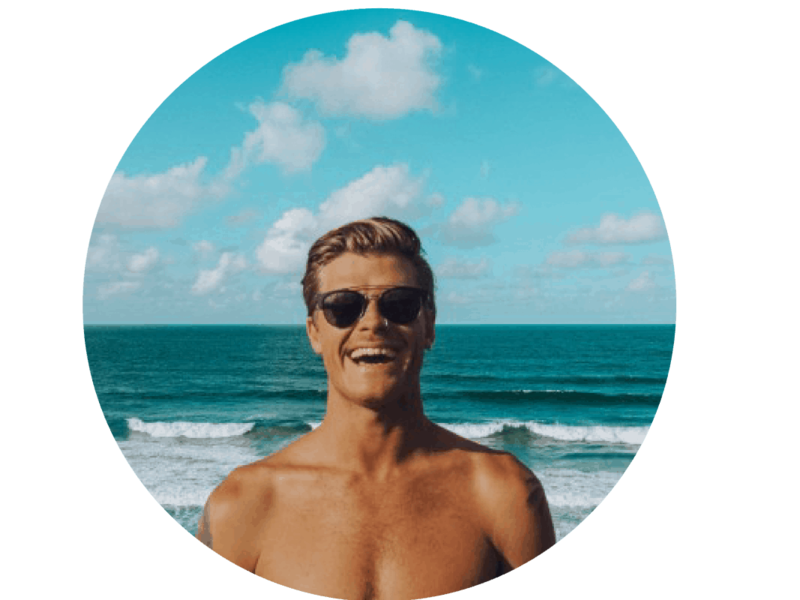 CLICK HERE to see the full blog post of Atuh Beach! 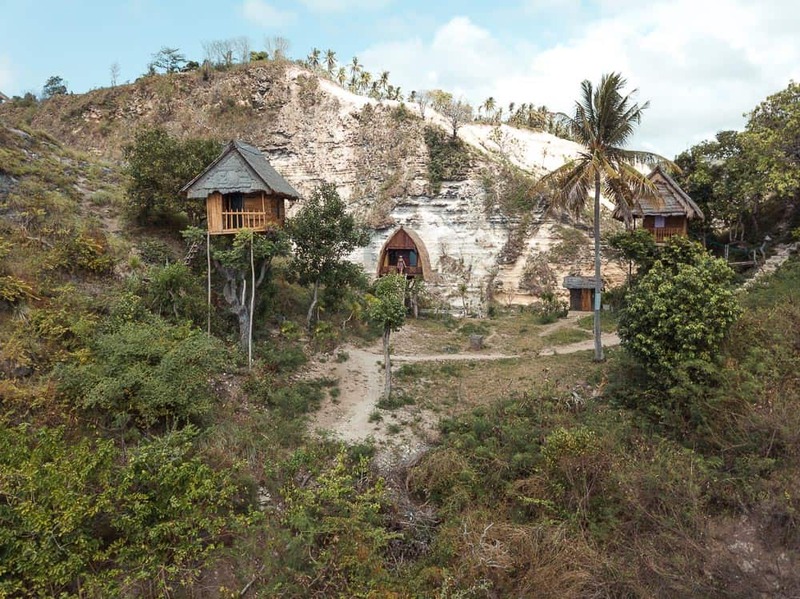 If you haven’t seen the Rumah Pohon Tree House Nusa Penida on social media I would be amazed. This Tree House has become popular very quickly thanks to the social media platform Instagram. 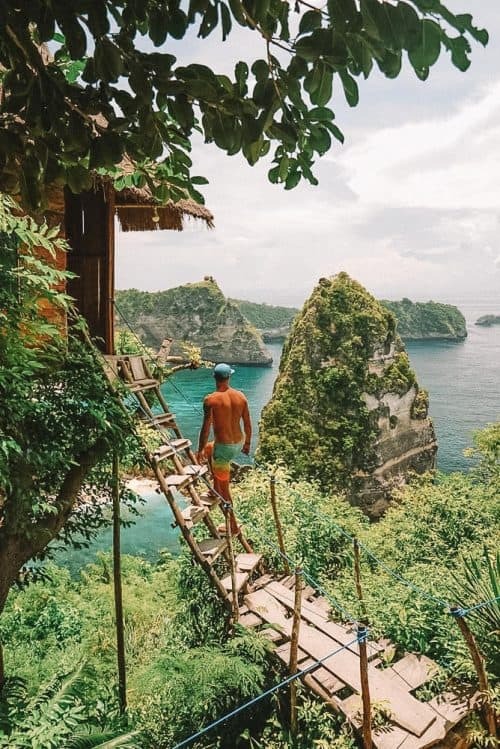 This cute little beach shack overlooks one of the most gorgeous bays known as Thousand Island and it’s one of the best things to do in Nusa Penida. This amazing tree house can be found on the far eastern tip of Nusa Penida island. From the main harbour of Toya Pakeh, it is approximately a one hour drive. You can actually book via AirBnb to stay at the Rumah Pohon Tree House which would be a pretty awesome experience! CLICK HERE to check availability and book in advance. You will arrive at a car park on top of the cliffs, park here and make your way down the track towards the beach. You will come across a small wooden ticket office where you will have to pay 5,000 Rupiah for the entrance ticket. The hike down the ridge takes no more than 5-10 minutes to the first viewpoint that overlooks the bay known as thousand islands. I don’t know why they named it Thousand Island when I could only see five or six islands haha. Regardless of the name, this is one of the most beautiful beaches I have ever laid my eyes on. CLICK HERE to see the full blog post of the Rumah Pohon Tree House! 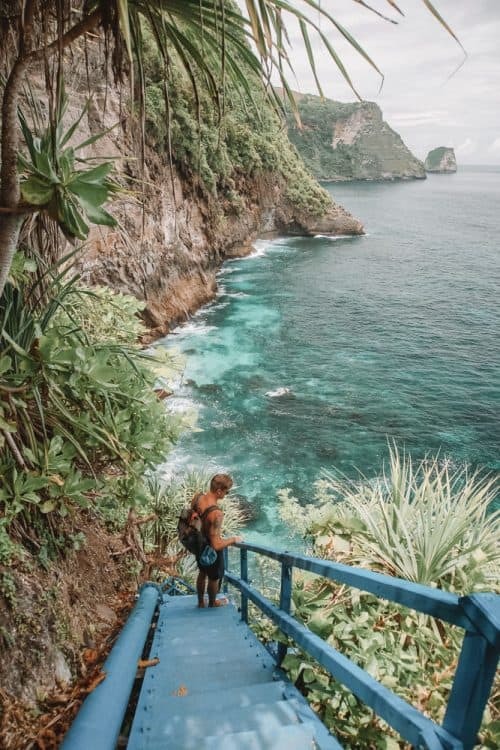 On the southwest coast of Nusa Penida, the ultimate adventure awaits at Peguyangan Waterfall and the Instafamous Blue Stairs. 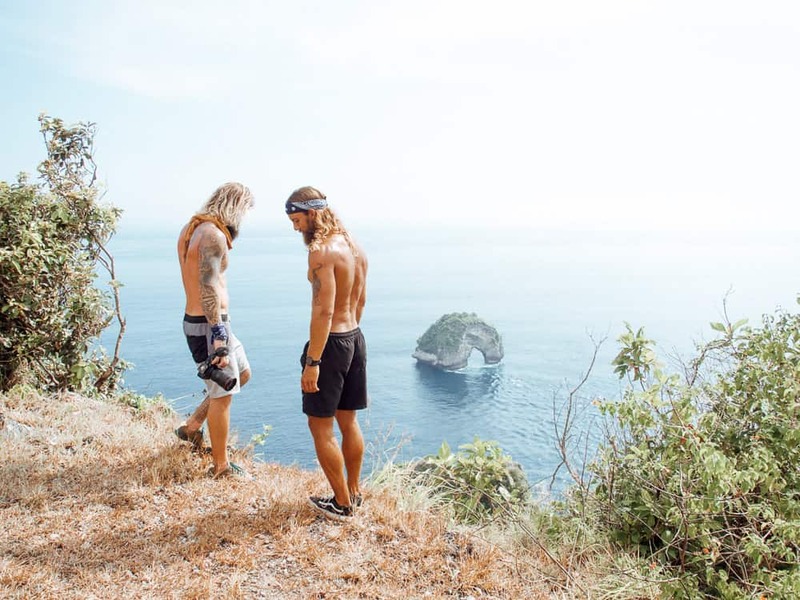 This location is off the beaten path and it takes a little longer to get to, though it is an experience not to be missed when exploring the best things to do in Nusa Penida island. Peguyangan Waterfall sits at the base of towering cliffs along the southwest coastline in Nusa Penida. From the main harbour of Toya Pakeh, it is approximately a 1-hour drive. You’ll arrive at a carpark at the top of the cliffs at Peguyanngan Waterfall and have to pay a small parking fee of 5,000 rupiah. 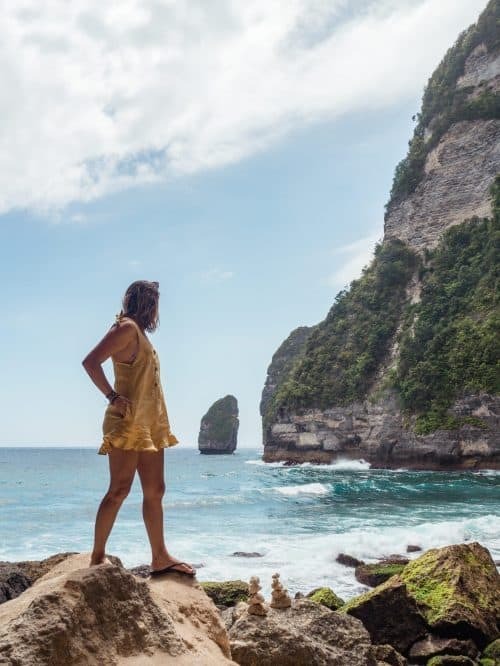 A sarong is also required to be worn as there is a sacred temple at the bottom of the cliffs right next to Peguyangan Waterfall. If you don’t have a towel or sarong to wear, they can be rented from the parking attendant for 10,000 rupiah. 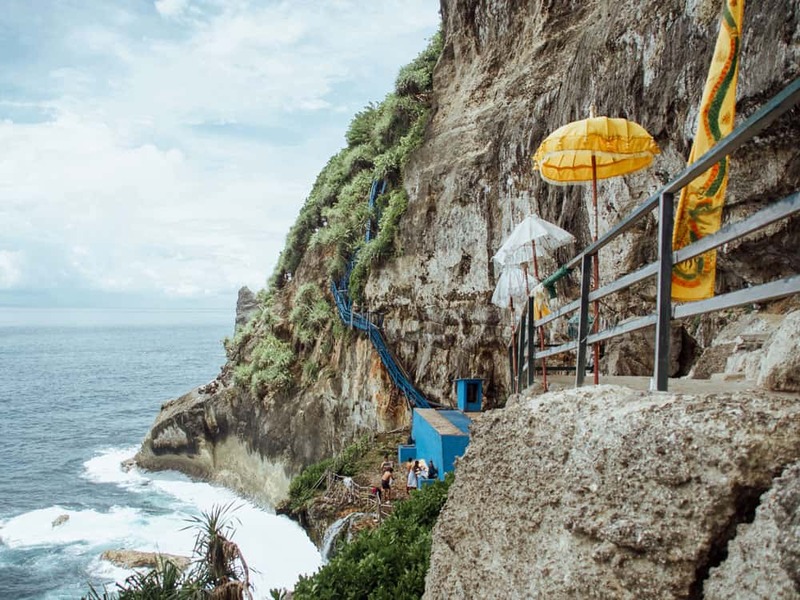 There are 750 blue stairs that are impressively constructed into the side of the cliff giving access to Peguyangan Waterfall. It is a good workout hiking down and then back up again that’s for sure! There are several viewpoints that make for great photo opportunities as you make your way down the blue stairs. After a 20 minute hike down the blue stairs, you’ll arrive at the sacred water temple that has 4 waterspouts. There were some locals showering under the spouts in their underwear with not a worry in the world. I had my turn under each of the waterspouts and then continued along the cliff to the Peguyangan Waterfall. The waterfall itself is not your common 50-meter meter waterfall flowing into a rockpool basin, but rather a waterspout between a crack in a rock where crystal clear water flows out into tiered rock pools and over the cliff edge into the ocean. The rock pools are shaded under a natural half-cave which is very unique and like nothing I have seen before. CLICK HERE to see the full blog post of Peguyangan Waterfall. Pura Goa Giri Putri cave temple is located on the north-eastern tip of the island. From the main harbour of Toya Pakeh it is approximately a 30-minute ride. Diamond Beach Nusa Penida is the most amazing beach I have ever been to, purely for the fact that it has only just recently been made accessible and I am one of few fortunate enough to experience this untouched paradise before it becomes one of the most popular things to do in Nusa Penida. Diamond Beach Nusa Penida is located on the far most eastern point of Nusa Penida island. Diamond Beach is the next beach over from another Nusa Penida gem known as Atuh Beach. The drive from Toya Pakeh to Diamond Beach Nusa Penida is approximately a 1-hour journey. 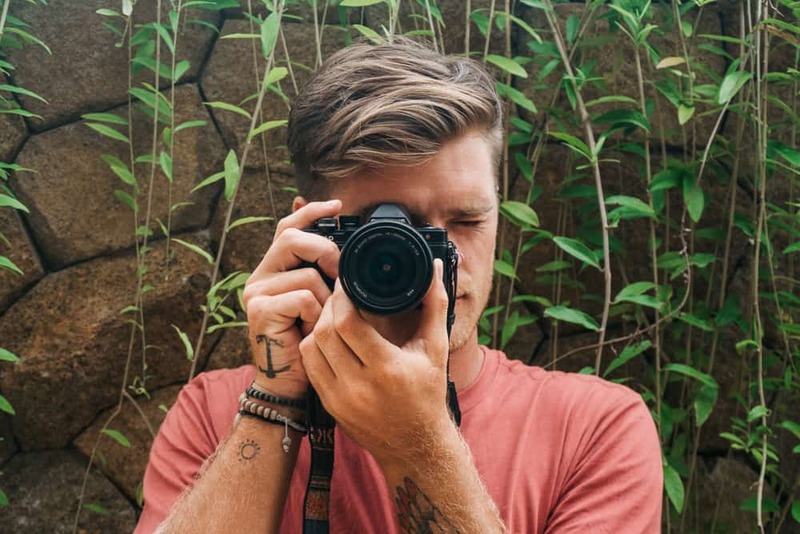 Want to travel full-time? ∼ Click Here To Learn How! There are two sections to Diamond Beach, one has vivid green mossy rocks and tidal rock pools but unfortunately quite of bit of trash was washed up on the sand here. 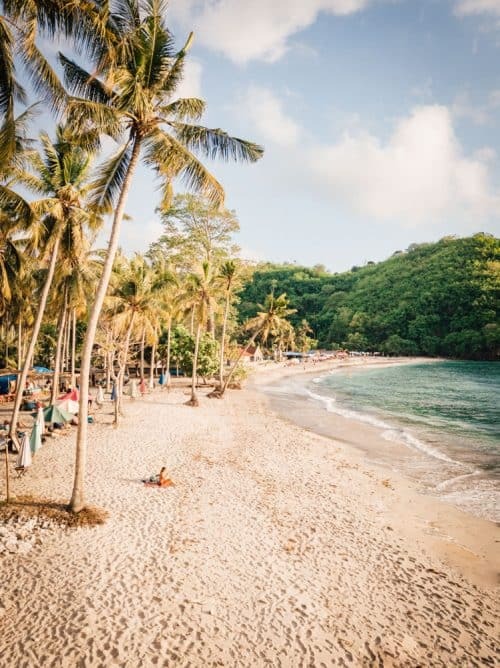 The second section of Diamond Beach Nusa Penida has glistening white sand, coconut palm trees, small caves and a more suitable spot for swimming. I was in complete awe at the sheer raw beauty that this location has to offer and to have the entire beach to ourselves took the experience to the next level! There are a few small caves to explore at the foot of the cliffs at Diamond Beach. I crawled inside one of the caves to get a quick snap and a different perspective of the beach. CLICK HERE to see the full blog post of Diamond Beach Nusa Penida. Tembeling Beach and Tembeling Forest are up there with one of my favourite things to do in Nusa Penida. Tembeling Beach offers a number of cool things to see including pristine white sand beaches, tropical rainforests, blue lagoons, hidden caves and cliff jumping spots. Tembeling Forest & Beach is located on the west coast of Nusa Penida Island, very close to the Banah Cliff Viewpoints. From the main harbour of Toya Pakeh, it is approximately a 45-minute drive to Tembeling Beach. 1. SWIM IN THE BLUE LAGOON: The main attraction at Tembeling Beach is the freshwater blue lagoon nestled in the Tembeling Forest. 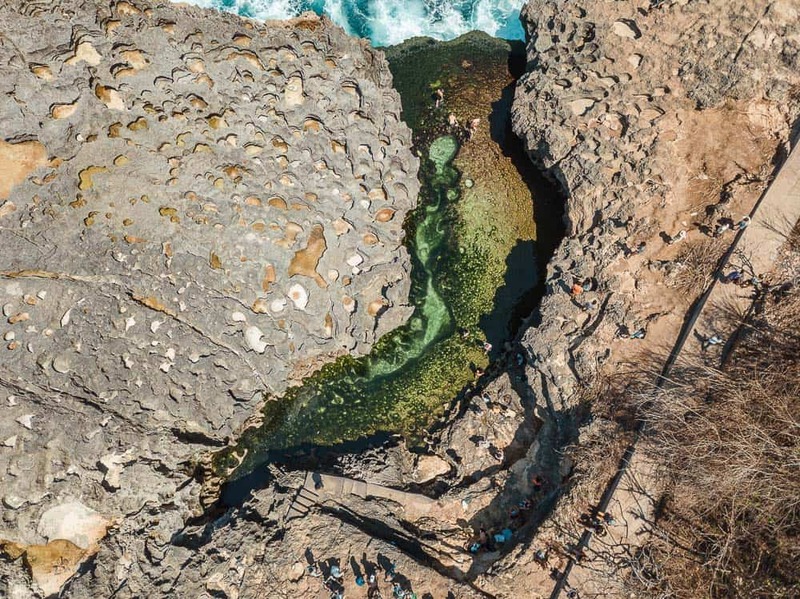 This freshwater natural pool is the perfect spot for a swim on the way down to Tembeling Beach. 2. CLIFF JUMPING AT THE BLUE LAGOON: There are 2 cliff jumping spots into the blue lagoon at Tembeling Beach. One is 3 meters high and the other is 5 meters. 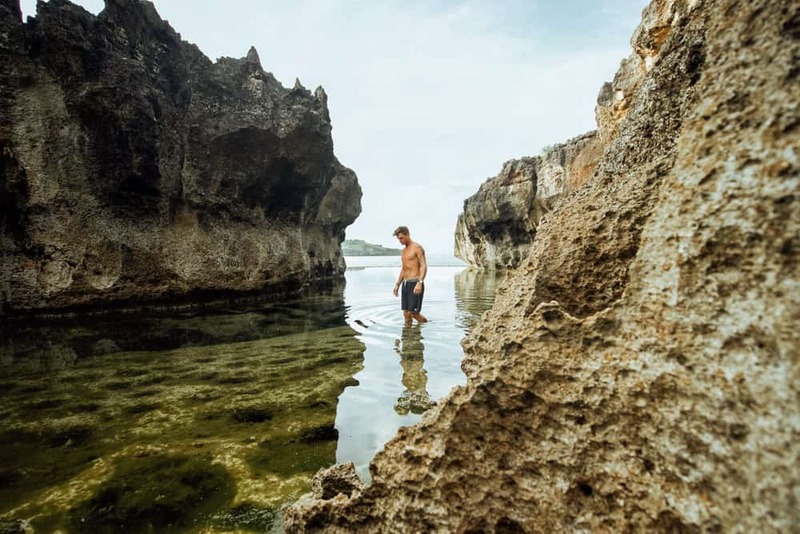 I did a depth check of the lagoon before doing some cliff jumping and I wasn’t able to touch the bottom. My guess is that the lagoon is approximately 3-4 meters deep. 3. 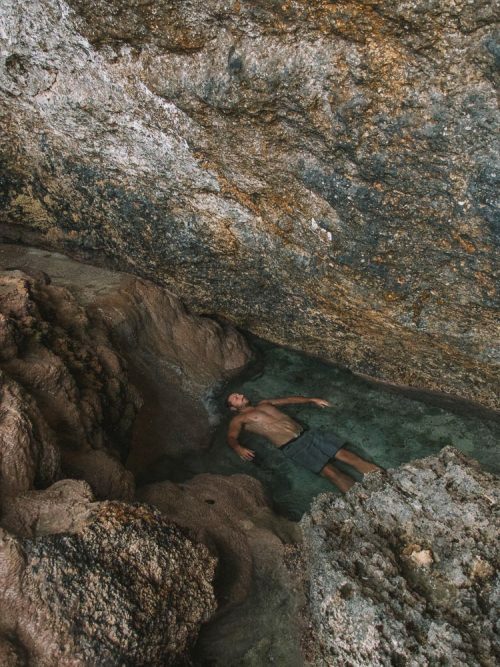 SECRET BEACH AND CAVES: Discover the hidden cave and secret beach just a short 2-minute walk from the blue lagoon through the Tembeling Forest. 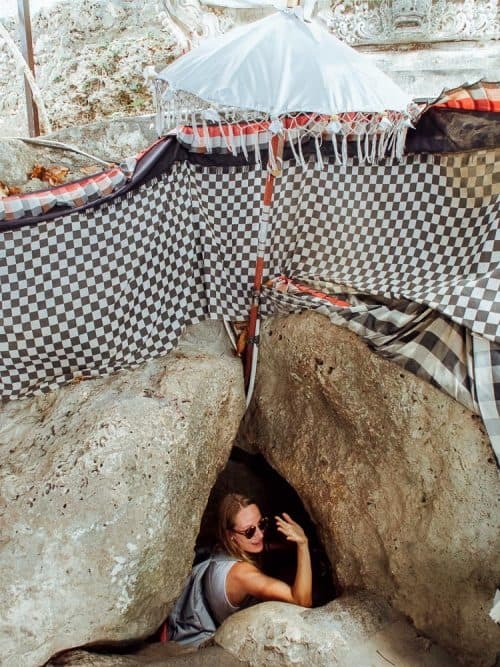 Squeeze through the crack in the rock into a cave that opens up on to a secret beach. There are hundreds of carefully crafted rock sculptures scattered across the beach on the other end of the cave. 4. JACUZZI POOL: Right before you get to Tembeling Beach there is a freshwater jacuzzi pool that the locals have creatively built on the edge of the cliffs. This is one of Nusa Penida’s best-kept secrets! Take a refreshing dip in the jacuzzi pool with incredible jungle views of the Tembeling Forest and Tembeling Beach in the distance. 5. TEMBELING BEACH: Last but not least is the beautiful Tembeling Beach. There is a rocky reef on the shoreline of Tembeling Beach and there a number of tidal pools to take a dip in but swimming in the waves here is definitely not recommended. CLICK HERE to see the full blog post of Tembeling Beach. Crystal Bay Nusa Penida is a palm tree haven and an awesome snorkelling location on the west coastline of Nusa Penida Island. Crystal Bay is one of the best beaches to explore on the island, especially at sunset! 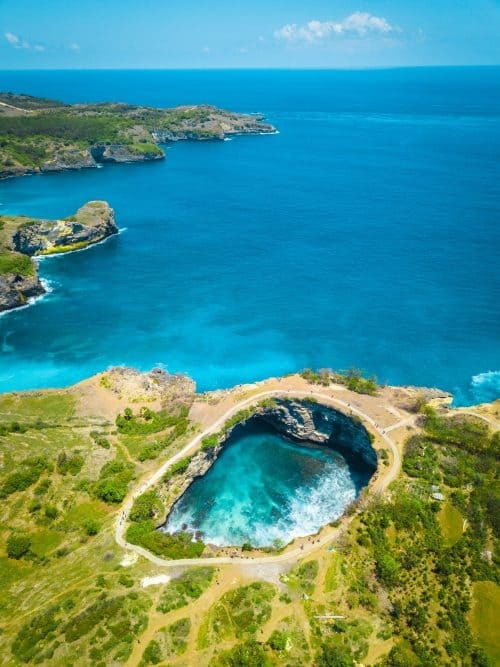 Crystal Bay is located on the west coast of Nusa Penida Island. From the main town and harbour of Toya Pakeh, it is approximately a 20-minute ride to Crystal Bay Nusa Penida. The drive towards Crystal Bay is an experience in itself, passing through local villages and palm tree-lined roads, eventually coming to a dead end on the beach front. 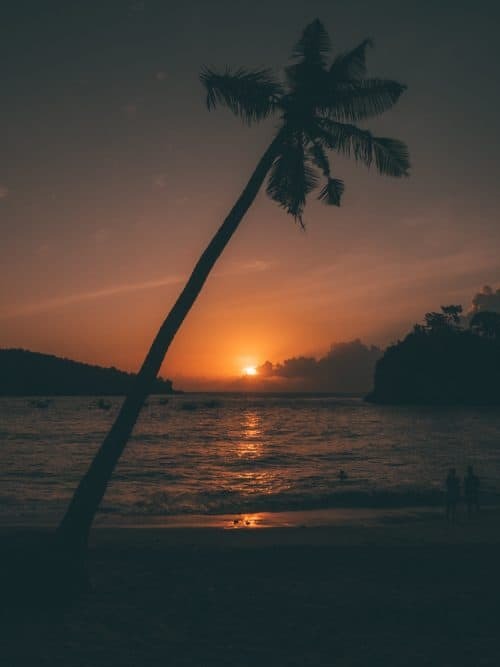 There is a number of beach shack cafes, traditional temples, a coconut palm tree forest and colourful umbrellas along the shoreline at Crystal Bay, all which overlook a gorgeous beach cove and a nearby natural rock island. I spent the afternoon under the shade of a palm tree on Crystal Bay Nusa Penida, sipping on a freshly harvested coconut while waiting for the sun to set. I noticed a couple of other tourists in small groups spread out across Crystal Bay Beach having a few sunset beers, the place to be it seemed! 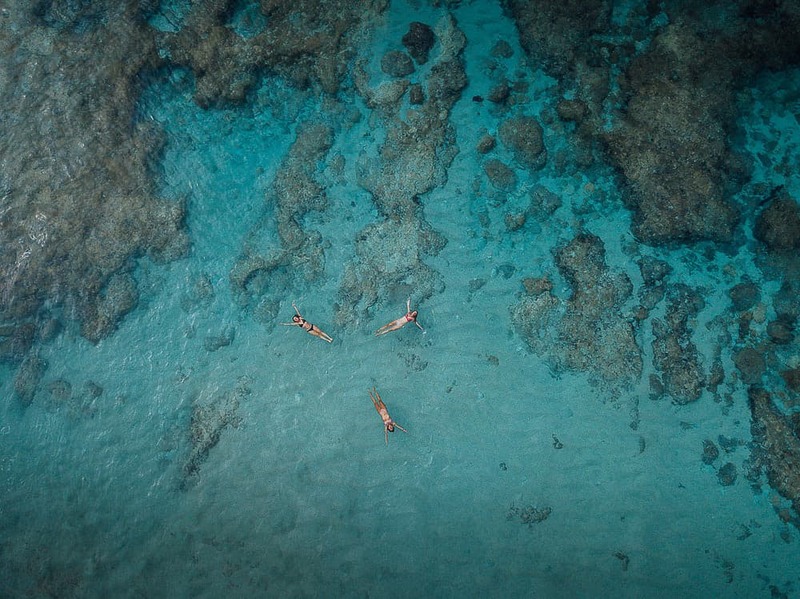 Just offshore, there is a colourful reef system beneath the surface of Crystal Bay Nusa Penida, a very popular spot for snorkelling with all sorts of fish, turtles and other sea critters. I went snorkelling in Crystal Bay on a different occasion as part of the Manta Point Snorkelling Tour. 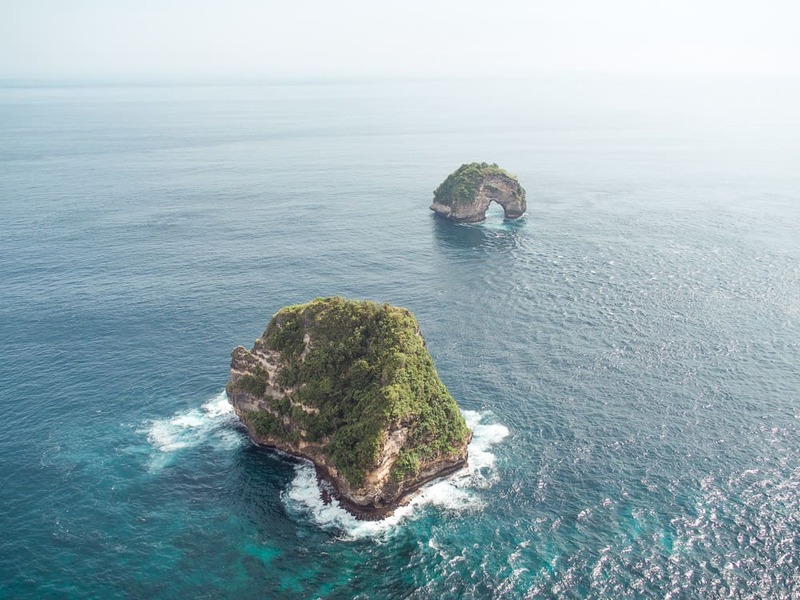 CLICK HERE to see the full blog post of Crystal Bay Nusa Penida. Teletubbies Hill Nusa Penida is best known for its lush green rolling hills and incredible viewpoints that overlook the entire Nusa Penida Island. Teletubbies Hill is located in the southern mountain ranges on Nusa Penida Island. From the main town and harbour of Toya Pakeh, it is approximately a 45-minute drive. I reached the top of the mountain range on my scooter and followed the only tar sealed road along the ridgeline. I began to see rolling fields of green and rounded peaks that gives Teletubbies Hill its name. We pulled over on the side of the road, parked the scooter and went off to explore half a dozen different viewpoints at Teletubbies Hill Nusa Penida. On a clear day, you can see the neighbouring island of Lombok and the almighty Mount Rinjani, the second largest volcano in Indonesia. In the valleys between the Teletubbies Hills are terraced fields of food crops and random clusters of coconut palm trees. I decided to fly my Mavic Pro Drone to capture Teletubbies Hill Nusa Penida from above. The best way to explore Teletubbies Hill Nusa Penida is on foot. Take a short hike to get a different perspective of this incredible landscape from nearby peaks. 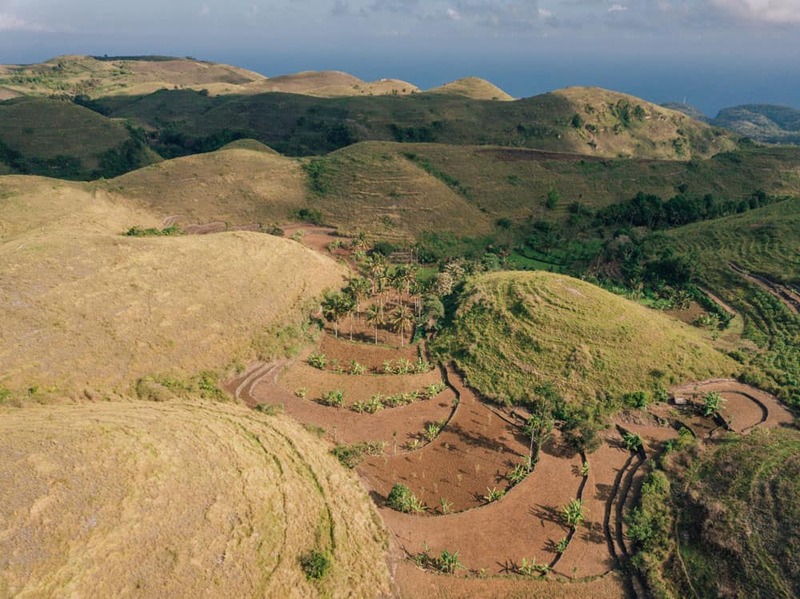 CLICK HERE to see the full blog post of Teletubbies Hill Nusa Penida. 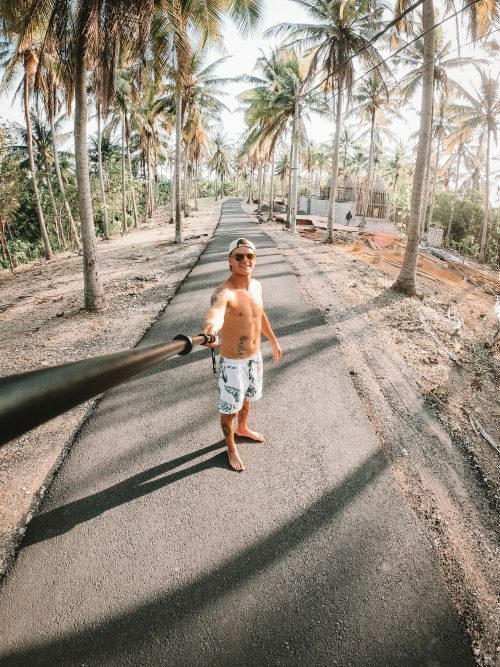 Nusa Penida Island has a number of palm tree-lined roads but there is one road, in particular, that is quite Instafamous and makes for the ultimate photo. 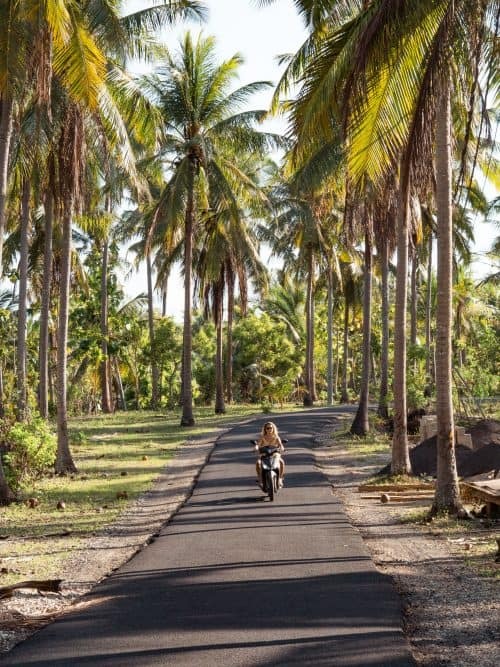 The Palm Tree Road on Nusa Penida is one of the most photogenic locations on the island and a definite addition to the list of things to do in Nusa Penida. The Instafamous Palm Tree Road is located on the way to Crystal Bay. If you are heading here from Toya Pakeh, it is a 20-minute drive. The palm tree road is approximately 2km before Crystal Bay. The Nusa Islands is a trio of islands just 30-minutes by boat from mainland Bali. From my experience having visiting all 3 islands I recommend spending at least 3 nights on Nusa Lembongan, a day trip to Nusa Ceningan and then at least 3-4 nights on Nusa Penida. This will give you plenty of time to enjoy all the awesome spots the Nusa Islands has to offer! You may want to read my other travel guides to help you plan your trip to the Nusa Islands. Click on the links below to see more! 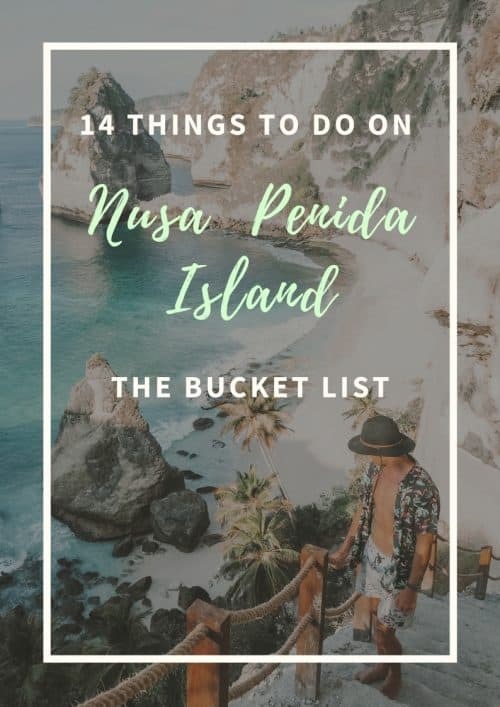 Thanks for reading this article and if you have any questions about the best things to do in Nusa Penida please drop me a comment below. Your post are very interesting and lovely. But please help me out with this Jonny， for the tree house ， there is no room available when we plan to go. Can we just go there and take photo. is that allowed? Oh I like the tree house. Staying there may bring us such gorgeous view that we can’t have in all Indonesia. I think I could stay there in my whole life if possible. Thanks so much for your stunning and inspiring post! 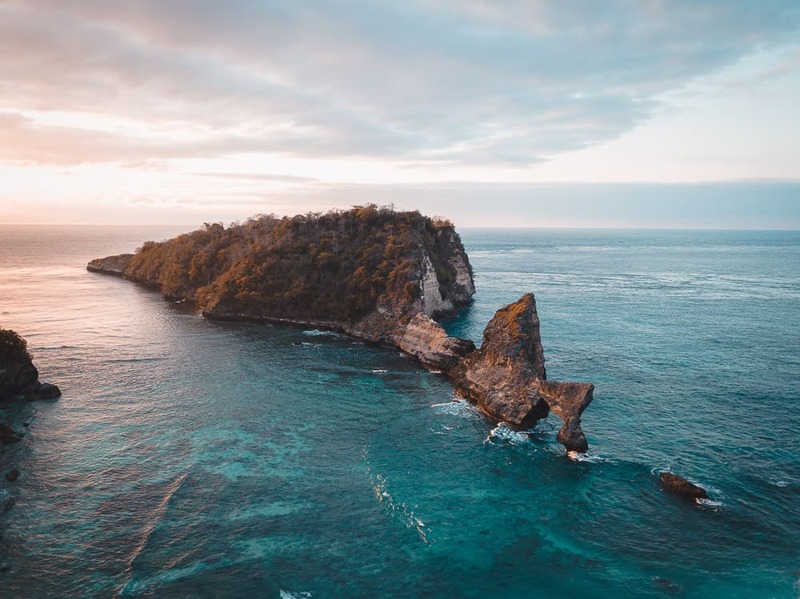 I am trying to find references about Nusa Island, and your post is definitely amazing ! Hi, Jonny. I’m from Jakarta and I’m planning to stay at Nusa Penida for at least 3 or 4 days. There is one thing that I want to ask; is it possible for me to swim to the arch at Atuh Beach and climb it? Is it far from the beach, and is it shallow water? Thanks so much! Hello, Yes it is possible to swim to the arch but only when the sea is calm. It is quite far from the beach so you must be a good swimmer. The rock is very sharp so where some footwear if you wish to climb the arch. Be safe and have fun!